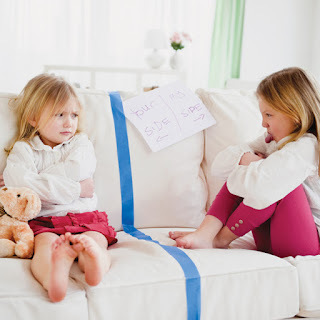 Ramblings from a Raucous Mind: Sibling squabbles...or is it more than that? Sibling squabbles...or is it more than that? Recently, I took my six-year-old daughter to a friendship course, aimed at helping kids her age proactively identify and deal with "friendship fires" instead of just shrugging off or ignoring issues that arise with friends. She hasn't had much trouble with her buddies, but when she mentioned that one of her older friends was bossing a group of them around on the playground at recess, I thought, well, maybe we do need some guidance. I figured it wouldn't hurt to equip both her and me with skills to address such situations before we have to tackle any "mean-girl" scenarios that are bound to arise as she gets older. What's interesting to note is how we're so quick to respond when we feel like other kids might be making our kids feel bad, but when it's our own kids making each other feel bad, we're a little slower to respond. Some parents barely respond at all, letting siblings just sort it out among themselves. While this can work to certain degree, often, it ends badly. And for some, it can end really badly when one sibling gets bullied by another. Imagine having to live with your bully! I address the topic of sibling bullying for Today's Parent magazine.